Hannah Petkau’s sculptures are alive with the vibrancy and possibilities of matter. 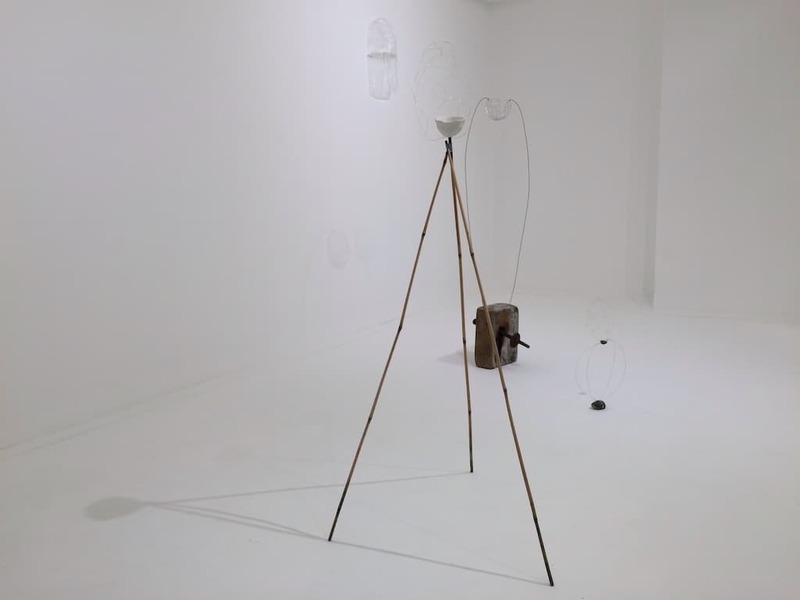 Materials—plastic, wire, string, clay, rock, wood—take on a life of their own, or have just had one all along, which Hannah reveals in the way she listens to objects. 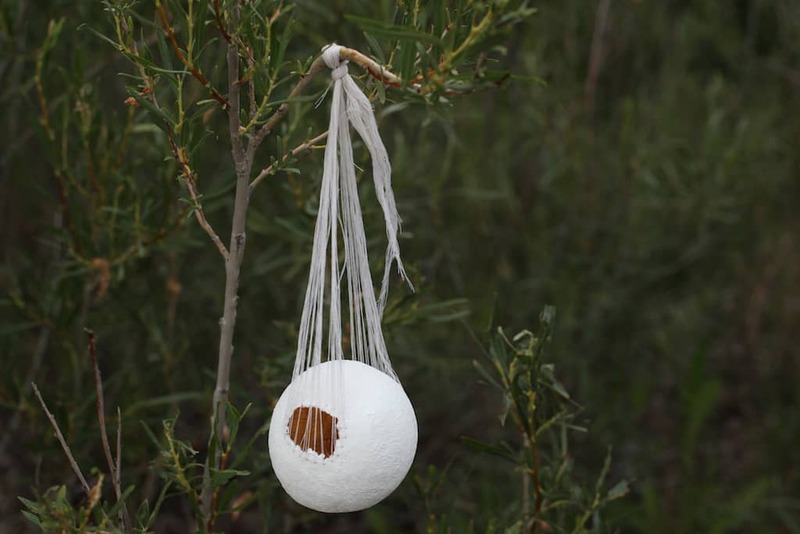 Working primarily with found materials, she brings to mind Eva Hesse with her strange ‘ambiguous implements’ and fictitious objects, as she calls them. In the dominant materialist frame—which posits humans as active subjects in a world of dead, unconscious matter—it is electrifying and enchanting to encounter work that speaks of collaboration between human hands and other active forces. In a reversal of the usual subject-object relation, the vitality of her sculptures infuses the viewer with a new kind of animacy, as they come alive to a kind of agency present not only in Hannah’s ‘implements’ and assemblages, but in objects everywhere: roadside trash, saddle scraps, insect homes and the myriad ways in which materials are constantly in process, manipulated and sculpted by all kinds of forces, including, in this case, a young sculptor. Hannah grew up on Cortes Island, a small northern gulf island in British Columbia, Canada, daughter of the Oysterman, as he’s known—an oyster farmer, supplier and aficionado. Five hours from the nearest city, on Cortes art, craft, industry and self-sufficiency are a way of life: Cortesians build their own homes, mill their own lumber, grow, raise and catch their own food, weave, wildcraft, spin wool, write novels, manage their own resources (through decades-long, ongoing battles and negotiations with logging companies) and are some of the most eccentric and resourceful people you will ever meet. Hannah grew up on the beaches of Cortes, where matter appears and disappears twice daily with the tide—Styrofoam, rope, bits of log booms, shoes, spent flares, floats and all manner of treasure and trash (full disclosure: I also grew up on Cortes, more than a decade before Hannah. We met for the first time last summer). 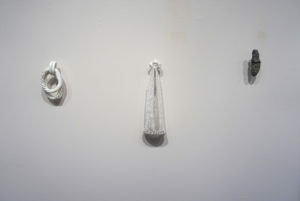 Her solo show ‘ambiguous implements’ at the local Old Schoolhouse Gallery in the summer of 2016 was the talk of the season—everyone from the most senior artists on the island, to art collectors in New York, were aglow with awe and fascination about her work. 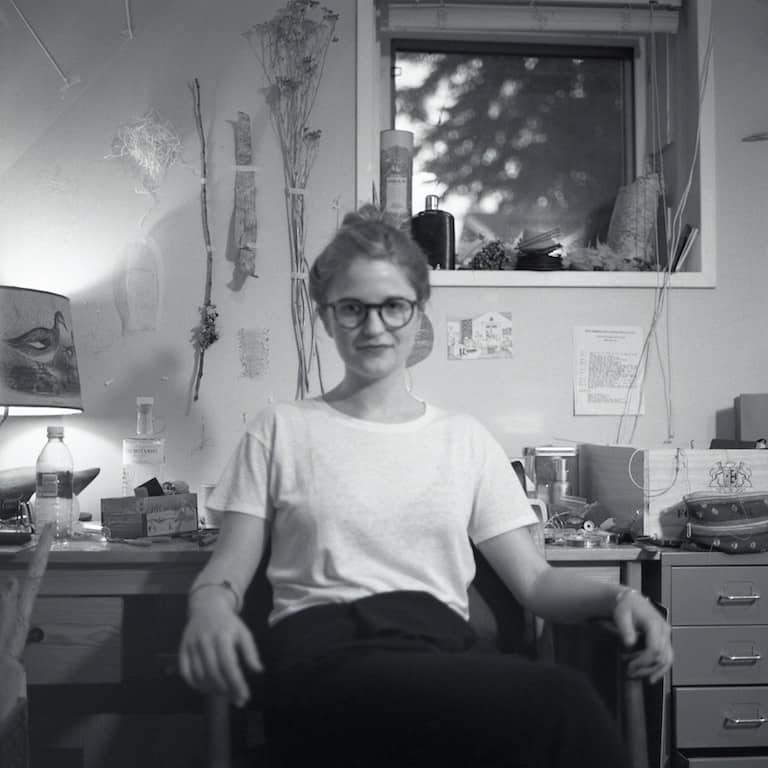 Hannah Petkau is a visionary force, and one to watch and think on. I had the pleasure of speaking to her via email in Calgary where she currently lives. 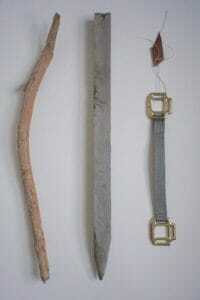 I first heard about your work because of a solo show you did at the Schoolhouse Gallery called Ambiguous Implements. Can you talk about what you mean by ‘ambiguous implements’, and the role of ambiguity in your art in general? I think of ambiguity as a way of blurring definitions and disestablishing notions of what something is and what its use may be. ‘ambiguous implements’ is a collection of assemblages manipulated by my hands and previous unknowns, combining the unknown found with my constructions, ambiguous in both origin and purpose. There is something both unsettling and freeing about being in a state of not knowing. For me this is often where the most exciting ideas emerge. This begins when I discover some object out on a walk, at the thrift store or in other day-to-day occurrences. Shards of wood, interesting rocks and pieces of metal or plastic are a few of the items that end up in my studio but there are many more that I am unable to describe. The unusual forms and materials promote intrigue of all the possible interactions, both past and potential. Your work seems to exist in a state of between-ness: between human and natural actions, and ‘between making and being made.’ Can you talk about this in relation to your work and practice? I see my work as a reflection of the outlook I strive to have on the world (not always successfully). It is easy to embody an approach that is one-sided and rooted in the polarities and differences, but in reality, things are far more complex. Creating work that negotiates these seemingly contradictory forces and states encourages a broader understanding and perspective. Many of the driftwood pieces that are incorporated into my work are a perfect example of this between-ness. Each piece carries a story of its previous existence; transformed from a natural resource to a commoditized material, utilized and discarded to be reclaimed by the natural environment as continuity of its lifecycle. The shapes of the driftwood pieces are of a manufactured state, milled boards, tongue and groves cut for what may have been a floorboard, drilled holes, and remnants of paint. Natural forces inform their presence as much as the human touch does. You’ve said that your work “negotiates the interplay between humanity and what is thought to be nature.” Let’s talk about “nature”: how do you think about this concept, and the way it is used? How does this figure in your work? This is a continuation of the “between-ness” I was just talking about. Perceptions of what is natural and artificial have become so intertwined that differentiation is hard to discern. Houseplants are a perfect example of this. They are most often cultivated by people (perhaps even genetically engineered for our benefit), sold and purchased, and brought into the home for an element of “nature” but most likely these plants have never actually been outside. I see these blurred notions to be aligned with a longing for natural authenticity, and a desire to define that which is not static or solitary. Rather than contradict this, I seek to exist in an intermediate space. Though I cannot deny that I have been seduced by the beauty of nature, my engagement and approach are somewhat of a sceptic. There is certainly an element of this “nature” in my work but the suspicion and intentional ambiguity of the materials and my approach does not isolate them from the human interaction but rather includes it. Optically and energetically, the meeting of fragility and solidity in your work is so striking. 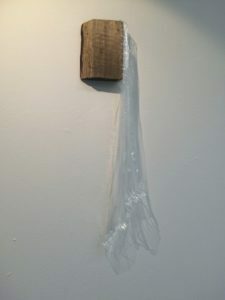 You often join very delicate materials like wasp paper, wire, hand-cut plastic bags, and shadows with very solid materials like wood and rock. What attracts you to the materials you choose, and/or how do they inform your process? I am drawn to materials that individually carry a certain duality or contradiction, which when combined, develops dialogs of how materials are perceived and interpreted. Plastic is a product of the earth, ephemeral and seductive with its thin translucency, yet its destructive permanence is immeasurable. It is a material that will outlast us all, despite it’s fragile and delicate appearance. Pieces of wood bear the marks of time, glimpses of a past resulting from both human and environmental interference. The transformative quality of clay is used to construct the imagined, mimic reality, becoming façades for these and other fictitious objects. Rocks both hold and conceal time, a recognizable solidity that appears definite. I always aim to create a balance between these materials and components, making them dependent on one another, but denying the impulse to impose a hierarchy. Nets, weaving, fine cut-outs, tiny architectures and work with light and shadow—your work involves a lot of craft. What role does craft/skill play in your work and process? What does craft mean to you? Is it something you learn in order to execute an idea, something that predates your sculptural work, or something else? I have always been a maker of things, and craft processes have been a part of how I work since I was a child when they were either taught to me or I figured something out that made do for what I envisioned. Meticulous and time-consuming ways of working such as knitting, weaving and detailed collage, have been a consistency in my work from early on. In more recent years, I have employed these intricate processes to materials such as plastic bags and sewing thread. This became a way for me to heighten the perceived value or importance of the mundane and utilitarian materials I was working with. You are originally from Cortes Island, British Columbia (as am I!). Did growing up in this wild, rural place influence your work? How? For that matter, how has any environment—Calgary, for instance—influenced your work? 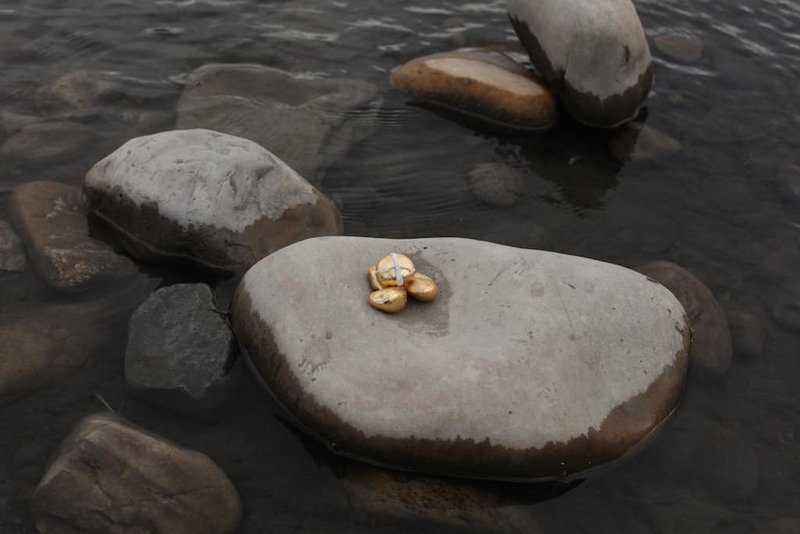 My surrounding environment, either Cortes Island, Calgary or wherever I may be, plays a significant role in my practice, most notably as the source for my found materials. I seem to collect things wherever I am, from beaches and roadsides to the restaurant where I work. I have found some of my favorite pieces in the most obscure of places. Growing up on Cortes Island, and now my yearly returns, have been huge influencers in who I am as a person and the work that results. It is one of the few places I have been where you are fully entrenched in your surrounding environment. Your life comes to depend and revolve around its seasons and weather for the growth of food, activities, housing, and electricity (or lack of). I appreciate this closeness. My life is now set at River Café, a restaurant that has been at the forefront of local, seasonal cuisine far before it was a culinary fad. The way in which ingredients are sourced and selected is aligned with me and my materials. Coincidentally, or perhaps not, it is located on an island in the middle of the Bow River, which runs through the heart of downtown Calgary. Despite being far from the ocean, I have found this closeness I crave in an urban setting, spending my days on an island and walking the river pathways in search of my next inspiration. I have been on a bit of a hiatus from making for the past 6 months but it will hopefully be coming to an end early April when I move into an amazing new studio space in the Calgary neighborhood of Inglewood. There are some materials and objects that I have collected which I am excited to work with such as a beautifully worn land surveyor stake and some pieces of leather from my uncle’s saddle workshop. The scale of ‘ambiguous implements’ has been rather restricted thus far but I am interested in potentially broadening it to include some larger freestanding sculptures or perhaps they will take form as something entirely different. To see more of Petkau’s work, go to her site.